A young boy riding a train looks back on the events of his life as he escapes from a life of poverty in THE NEON BIBLE. Although the film has Christian elements such as living by the way and will of God, it portrays Christians in a negative light. The movie has a low moral value be because it shows a boy liberating himself through violence. 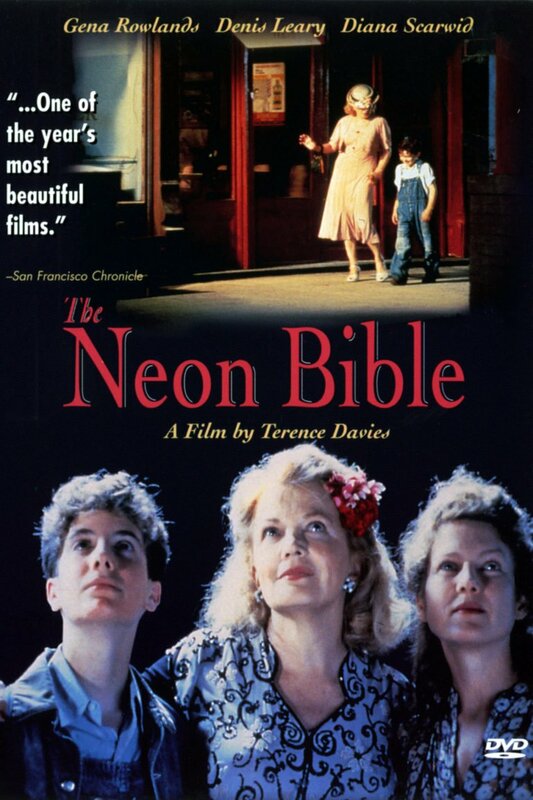 THE NEON BIBLE is a film about a young boy named David who tries to escape from a small Southern Bible belt town. It is the 1940’s and his father has lost his job and has turned abusive on his emotionally fragile mother. When his Aunt Mae comes to visit, David’s world opens up. Aunt Mae, once a night-club singer, is different. She is fun loving, flamboyant and wears loud red dresses. David is entranced by her. She fuels his imagination by showing him the big world waiting outside his threadbare home. When Aunt Mae leaves to pursue stardom, he is devastated. When his mother descends into madness, David is driven to violent acts to escape from his impoverished and desperate situation. Director Terence Davies has created a predominantly mellow and lyrical film. With his unique cinematic vision and style, he provides artful and colorful landscapes of David’s life in the little town. The film’s mood is always slightly poetic. It is a style that fascinates or perplexes. Despite having Christian elements, the movie does not portray Christians in a positive light. Religion, according to the film breeds a group of people who lack charity and compassion. It, therefore, is humanist and joyless. (H, C, Ab, L, VV, S, M) Humanist worldview stressing self-liberation & fulfillment with some Christian elements as well as anti-Christian undertones; 3 vulgarities & 3 profanities; some violence with abusive husband, young boy in a fight, girl slapping boy, implied lynching scene by Ku Klux Klan, physical self-abuse, & boy shooting man; implied sexual situations, boys ask for condoms & older woman seduces boy; and, miscellaneous immorality including affects of physical abuse, prejudice, & hints of racism.